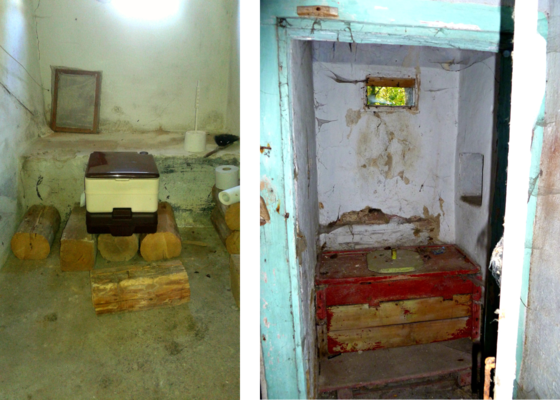 Reflecting on our hygienic practices at Nemilkov since last September (2016), it seems to us that we went through development stages of human hygiene since the Middle Ages. With time, the system improved. First, we bought a garden hose, which we took to the front of the chateau to replace the bucket. Our provisional shower offered an unlimited supply of water, which was great, but the water was ice cold! Luckily, there was a beautiful “Indian summer” last September, so the hose shower was bearable during the day. You can’t stop progress. A functioning hose! Bathing in Bušek was much better. Bušek is a picturesque artificial lake close to Velhartice Castle, surrounded by trees and rolling hills. We visited regularly until the end of October. The disadvantage was that we could not use soap in order to protect the pristine nature and wildlife. At least that is how the surroundings influenced us. At the beginning, we were not the only ones visiting for evening baths. Locals and cottagers were also enjoying the remaining warm days of the year. During one visit, an experienced local swimmer told us: “Today is the last day to swim. This is the last week of the year when swimming is possible.” It happened just as she predicted! We were the only ones there the next time we came. We found out why as we tried to get in the uncomfortably cold water that felt more like daggers! 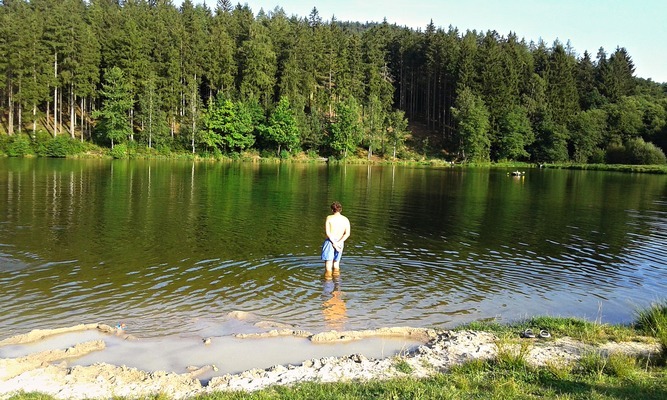 Bathing in the artificial lake- Bušek. The next advancement came in November when our friend, a plumber, laid water pipes in the ground floor and put the old drain back into operation. 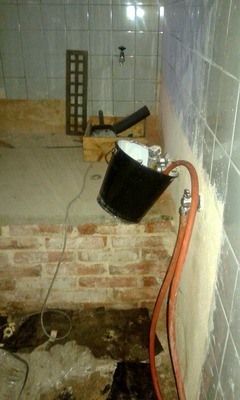 He built a provisional shower corner for us that we bought as part of our “chateau equipment”. Most importantly, we finally had warm running water! Since then, we have warm water in the shower and in the provisional kitchen. In winter months, the shower corner was often the only place to warm up. The problem was that we had no heating in our first-floor chateau bathroom. It felt that getting out of the shower was a heroic act as the bathroom temperature was often close to 0°C (32°F). While you can often cheat with personal hygiene, you cannot avoid the call of nature. 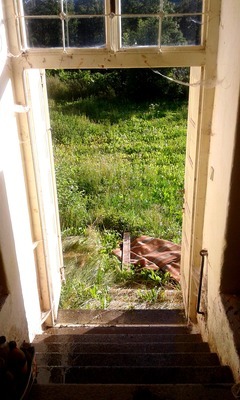 During the first visit to the chateau, we found only a dry toilette that was probably not used for 100 years. Therefore, the rule was: “go to the bathroom in Prague, or worst-case scenario- at the last gas station”. Because you cannot obey the rules all the time, we had to come up with alternative solutions. There is no public WC (water closet) at the village, so our savior was a dining hall of the JZD (Local agricultural association) in Velhartice. Hopefully, from now on we will only go there for a good lunch. The first toilette we bought was a chemical one, but you cannot stop progress, so we now have a normal flushing toilette with a functioning waste pipe. Although the toilet is on bricks (for now) and the provisional shower remains in the room without any heating, it provides quite an ‘authentic’ experience! 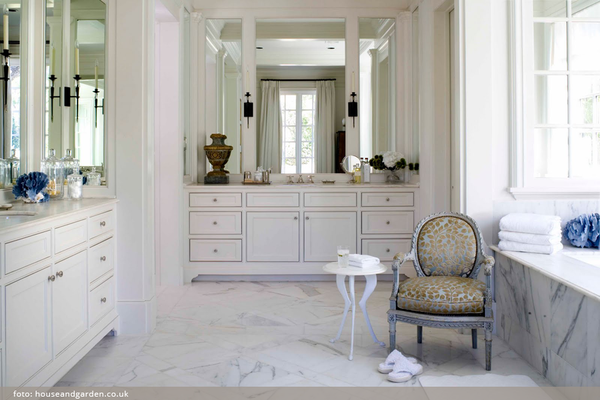 You would not believe just how cold the toilette seat can get…you must come experience it for yourself! Chemical toilette. The end of "the trips" to the neighborhood. Dry toilette from the past. We really cannot complain at all now, but nobody could blame us that we still would like to improve our hygienic conditions. We have plans, now we just have to realize them!